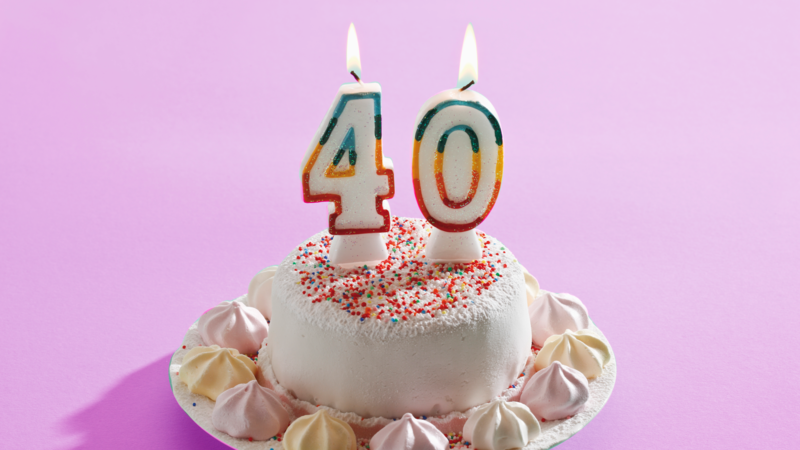 I Know Age Is Just a Number, so Why I Am So Anxious About Turning 40? Image: Westend61/Getty Images. Design: Ashley Britton/SheKnows. My best friend’s birthday is two weeks before mine, so for the last 22 years, I’ve asked that on her birthday, she tell me everything about turning another year older so I could mentally prepare. I’ve never been one to like surprises, so if I was going to wake up and not be able to read from far away at the age of 35, I wanted to know about it. (Spoiler: That didn’t happen). When I turned 21, I didn’t think too much of this particular milestone. Sure, I could drink legally now, but I had been in bars since I was 18 (thanks, college). I didn’t do 21 shots of tequila or have a blowout party. From that point on, about every five years or so, I would get apprehensive about adding another candle to my cake. In preparing for my best friend’s 40th birthday this past May, I purchased two candles, a four and a zero. As I was checking out, the woman behind the counter commented, “How blessed to reach the age of 40,” I nodded in agreement and was feeling accepting of my upcoming day in June. This feeling of acceptance lasted through celebrating my friend all weekend — until it came time for her to blow out those two candles. In that moment, I started to once again panic; but why? Hadn’t I heard? Jay-Z said 30 was the new 20, so 40 must be the new 30. I didn’t think I looked 40, at least the checkout people at the liquor store never thought so; I didn’t feel 40, but in all honesty, I’m not quite sure what 40 is supposed to feel like. Tired? Mentally exhausted? Spent? Accomplished? No one could seem to tell me. I spent the two weeks between her birthday and mine trying to understand where my apprehension was stemming from. Was I feeling like I had not accomplished enough in my 40 years on Earth? I had never made a life plan for myself, and honestly, if I had made one, I’m not even sure what it would entail. Getting married? Having kids? Another advanced degree? My attempt at marriage crashed and burned in my early 30s when I found myself engaged (and subsequently unengaged) to someone that was not the right fit. After that experience, I realized that a wedding was something that I did not want nor need. At the age of 32, I went through an illness that consumed my body for over a year, and when that was over, the idea of having children seemed too hard, too much to put my body through, and my boyfriend and I decided we would live that DINK (that is, double-income-no-kids) life forever. So, what was it? What did I think I was missing? That’s when it hit me. My perception of being 40 was based on her 40th and what I took that to mean when I was a kid. She was married with a kid and a job and group of girlfriends that she loved and for all intents and purposes, I had all of that too. As I sat at my birthday dinner, I looked down the table. Group of girlfriends that I love: check. Boyfriend/life partner that is also my best friend: check. Nieces and nephews that I spoil and then return to their parents: check. As I blew out the single candle, I was reminded of the woman behind the counter and wished to be this blessed for another 40.